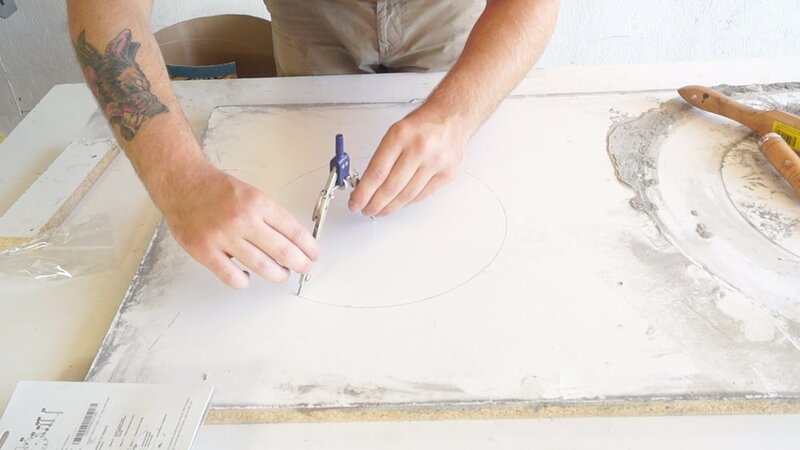 Today on Modern Builds I'm making a modern wall clock out of concrete. This is a pretty simple process and is a good beginner-intermediate concrete project. My first attempt at this broke. I didn't use any mesh reinforcement and it was just too thin and brittle. With the mesh, this thing is rock solid. Wooden Dowel (Same size as clock shaft). I started by cutting a piece of scrap melamine that will be used to create the recess for the clock motor. I cut the piece oversize at a 10 degree angle. the angle will help the piece be removed easily. I used a 1/4" drill bit to fit a 1/4" dowel in the center of the piece of melamine. the dowel is used to provide a hole for the shaft of the clock movement. Next, I cut a 4" piece of the concrete tube form on the table saw. Because these forms are never perfect circles, I used a compass to make a guide line that I'd use to line the form up round. The compass point also left a mark in the center of the circle that I used as a guide to drill a 1/4" hole in the center of where the form will be. I used hot glue to adhere the tube to the melamine. This is a thin pour, so for extra reinforcement, I used 1/4: wire mesh to strengthen everything up. Next, It's time to pour up the concrete. I did half of my pour, then put my mesh down, and poured the rest. A rubber mallet or a vibrating sander are great ways to get air bubbles out. I let the concrete dry two days to cure fully. Then I took it out of the mold. First, I drilled out the dowel, then I popped the melamine out. I used a cheap hanger I stole off of an old picture frame I had laying around to hang the clock. I used epoxy to ensure it would stay. Also, since the hole for the clock wasn't perfect, I used a fender washer spray painted white to cover the hole. My final step was to just put the clock motor in and hang it!